You are currently browsing the The Pet Product Guru blog archives for the day Thursday, January 24th, 2019. My cat Millie seems to sleep all the time. She’s now 14 and much calmer since the passing of my older cat Molly, and it’s very rare to see her darting around anymore. Yes there are times when she “flies” across the house but most of her day is going from one spot to another to sleep. 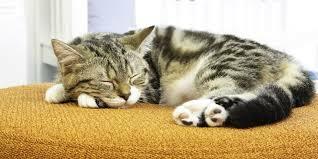 Did you know that the weather can affect how much indoor and outdoor cats sleep? Today is a very wet, rainy day on Delmarva. Cats love to nap on wet and dreary days! Whether you have an indoor or outdoor cat, don’t be surprised if she’s yawning more and sleeping longer when the forecast calls for rain. So today, I expect that Millie will be in her favorite spot snoozing the day away. Also when a cat gets older, she may sleep even more. Cats usually sleep two thirds of their life away. Traditionally, their energy is saved for hunting for their prey. Thank you so much! We’ve been running our radio station and our Pet Blog for many years!